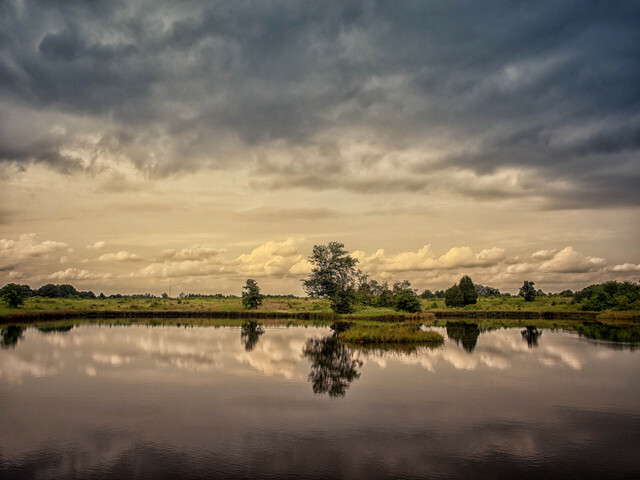 One of the first images I processed in Lightroom; this is Painted Turtle Pond in Occoquan Bay NWR. 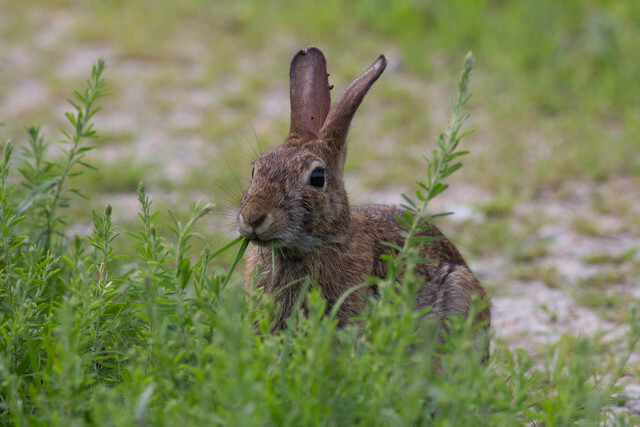 A bunny at the refuge. 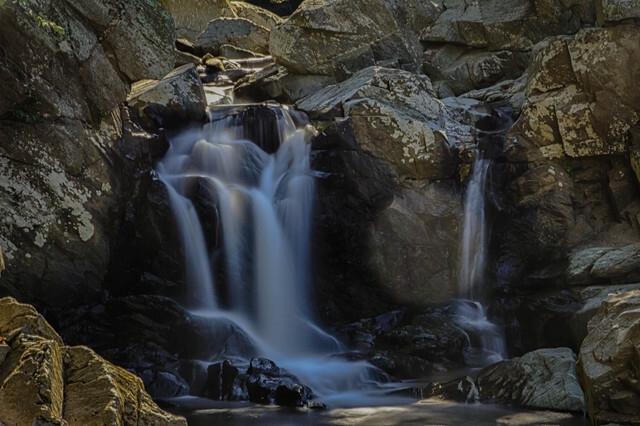 This is where Scott’s Run spills into the Potomac in a nice little waterfall. This is also HDR. 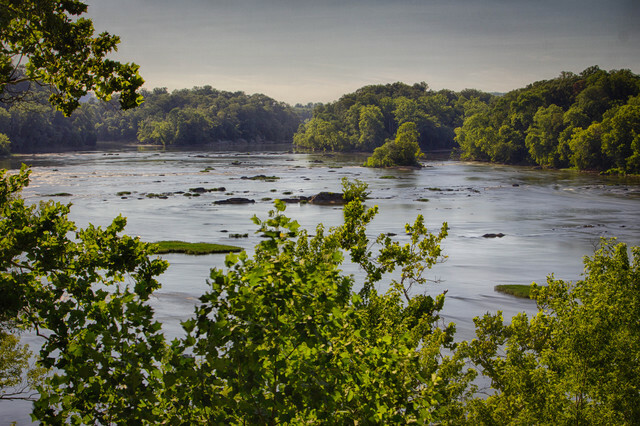 This is the Potomac River from a lovely overlook rock in Scott’s Run Nature Preserve. 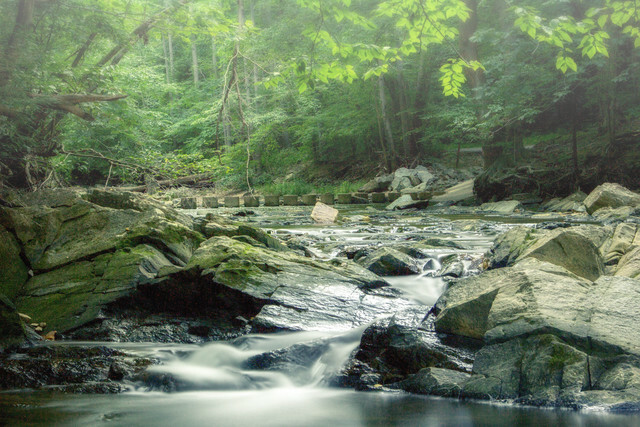 Another HDR/long exposure. 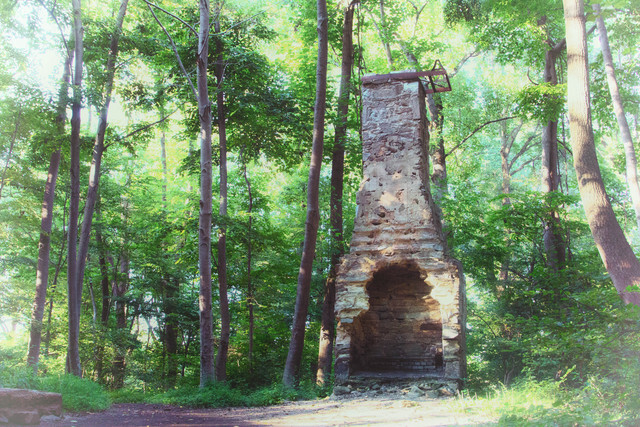 The Burling House ruins – pretty much just a fireplace – in Scott’s Run Nature Preserve. 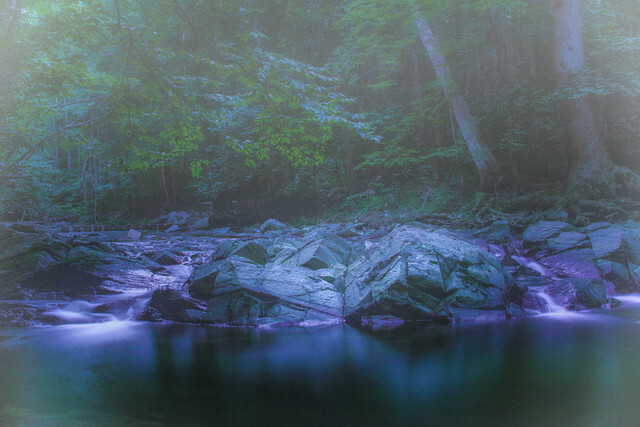 Long exposure of Scotts Run maybe a quarter mile north of the waterfall. 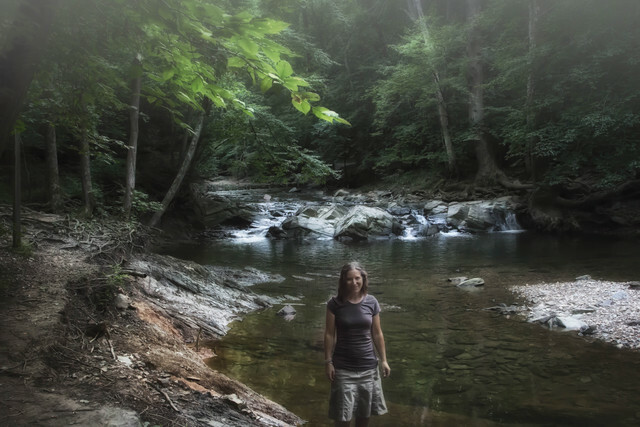 It’s kind of hard to resist taking self portraits when doing long exposures, what with the tripod already set up and the shutter remote in my pocket…this is me at Scott’s Run. Scott’s Run was Friday night after work. 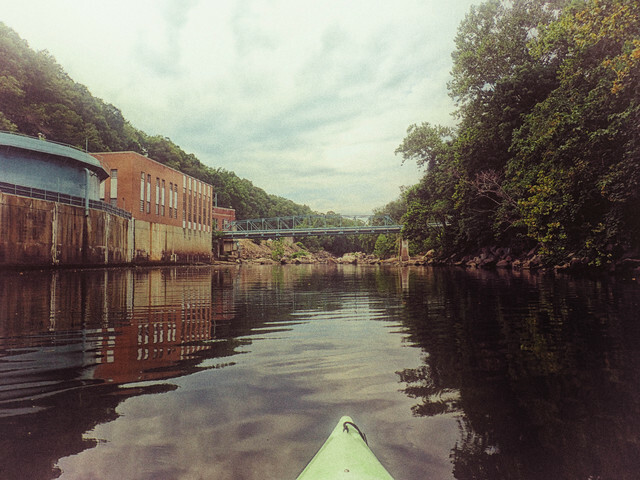 Today, Sunday, Mark and I went kayaking on the Occoquan River. 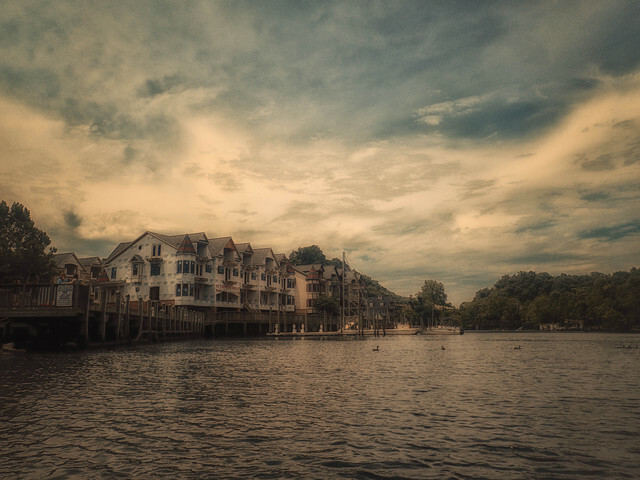 This is the historic town of Occoquan. 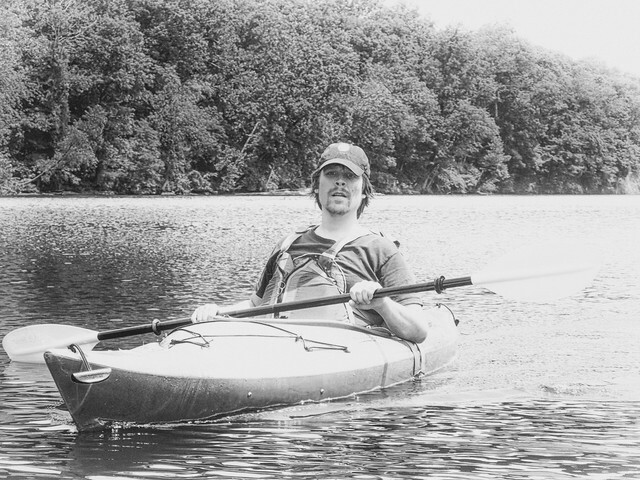 Mark kayaking. Here is a fact about me: I taught myself how to use a film SLR in high school, eventually becoming a photographer for our school newspaper, and I strongly preferred B&W to color film – probably 75% of my pics from high school and college are B&W. So I’m loving the B&W “film” options in Silver Efex Pro. My dilemma: how to express my love of the look of vintage photography without having my photographs look like Instragram filters…I think this is the first time I have ever ADDED grain to a photo. Yikes. 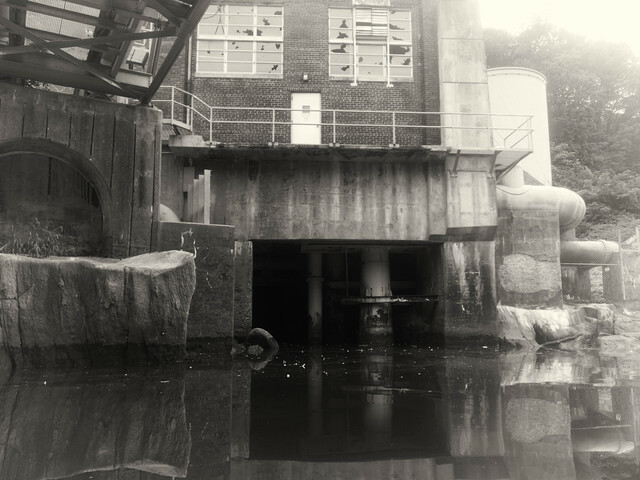 There is an old water treatment facility that is no longer used on the Occoquan River in the town of Occoquan. 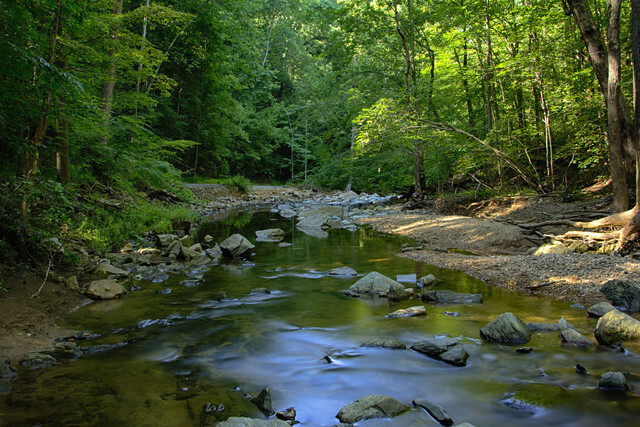 Fairfax Water is supposed to be removing it to allow for the creation of a park. 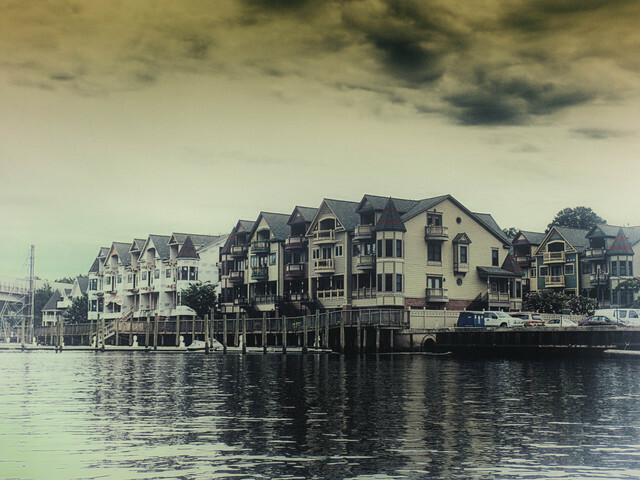 It’s kind of an eyesore, but then I also kind of like industrial shots. 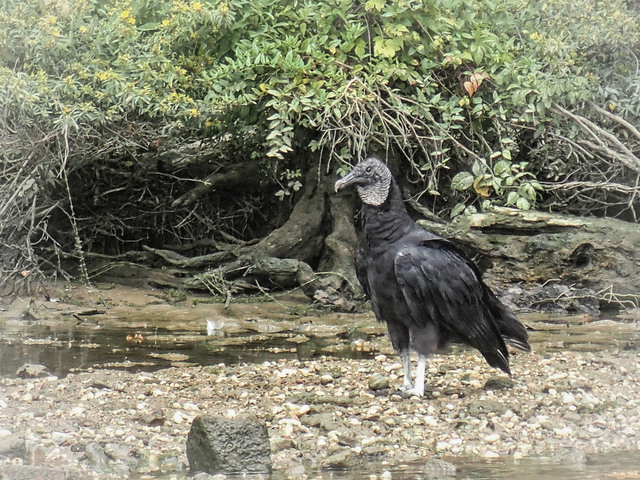 Finally, this is not a great picture because I was using my cheap waterproof camera instead of a dSLR but I include it for Jes – a bunch of black vultures let me kayak right up to them as they bathed. While many of my fellow Americans were traveling, watching parades, attending or hosting cookouts, and watching fireworks or setting off their own fireworks on Friday, the Fourth of July, I for one was just happy to have a DAY OFF. No work, no raccoons, no raptors, no obligations. I didn’t set an alarm and I slept until 10:30! It was so great! And the weather was sensational: clear skies and about 80 degrees with none of that thick humidity that so characterizes summer in the DC metro area. Ordinarily weather that spectacular would have pulled me to a park, but I figured they’d all be crowded and anyway, I kind of felt like I needed a day of rest. So instead I spent what would have at one time been a normal amount of time in the kitchen but for me lately was a LOT of time. I decided to make a fairly traditional Fourth of July dinner for Mark and myself, and I’m going to share some of the recipes! That’s right, I remembered this is a food blog! Put the sauce ingredients into a blender and blend until smooth. 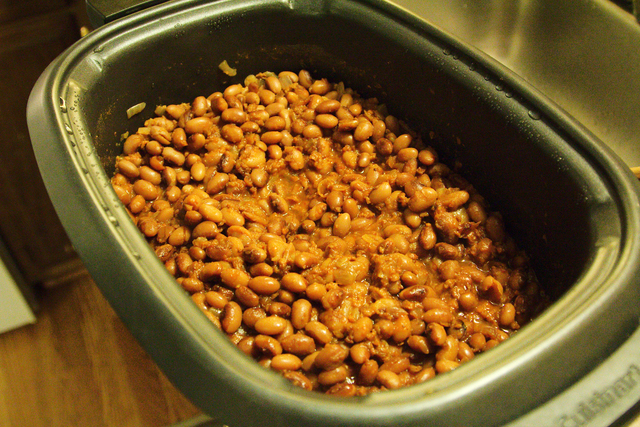 Drain the beans and place them with the rest of the ingredients, including the sauce, into a slow cooker and cook on high for 5 to 6 hours, or until beans are soft. Here they are plated. Mark put his on his veggie dog, which is an excellent vehicle for them. Chop the potatoes – I never peel them – and put them into a medium to large pot. Cover with cold water, then bring the pot to a boil. Salt the water, reduce the heat and simmer until the potatoes are soft. You don’t want them falling-apart soft, but I like mine soft enough that they just start to break apart when I stir the dressing in. When they are done, drain them into a colander. Meanwhile, whisk together the dressing ingredients in a small bowl. 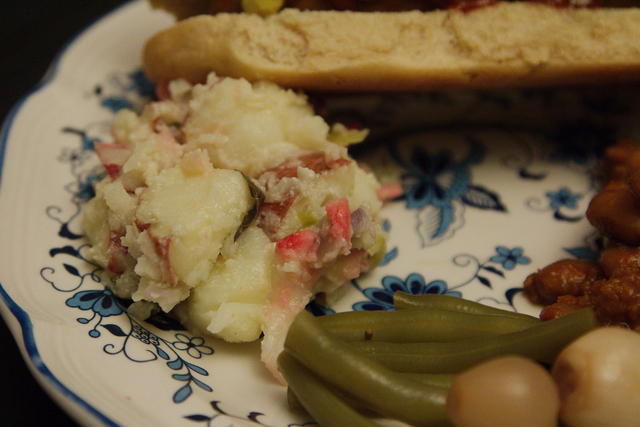 While the potatoes are warm, mix them together with the radishes, spring onions, and the dressing. Cover and refrigerate for at least a couple of hours. And this was my whole plate Friday night; also featured are some dilly beans, pickled onions, and a Field Roast veggie frankfurter in a homemade bun. I ALMOST made homemade hot dogs just so I could say everything I served was made from scratch, but then I made some sauerkraut and went on a 7-mile jog/walk instead (couldn’t avoid going outside in that spectacular weather after all). 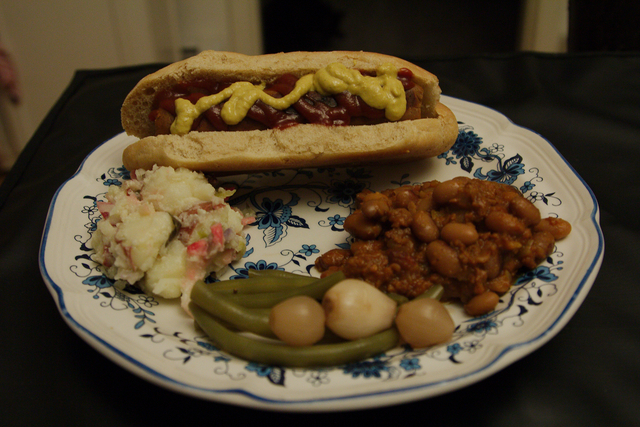 But Field Roast is good and I had three lonely frankfurters in the freezer to use up anyway. I got that picture while kayaking last weekend. 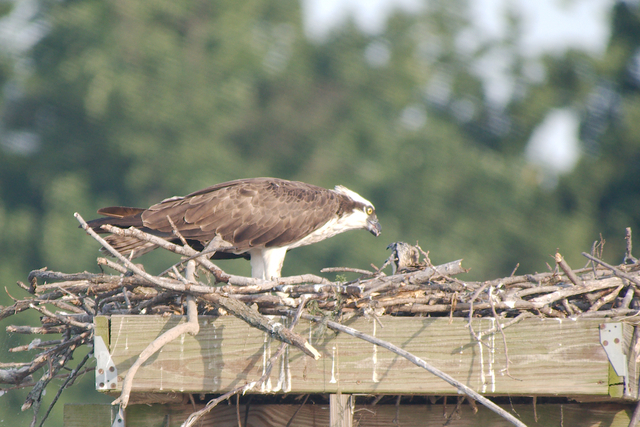 There is a nest right by our launch site, and as we were returning just before sunset, the mother (or father; they both tend to the young – but that one looks kind of big so let’s say it’s the mother) nabbed a fish and swooped back into the nest and started feeding the one baby. I was REALLY close. It was awesome! 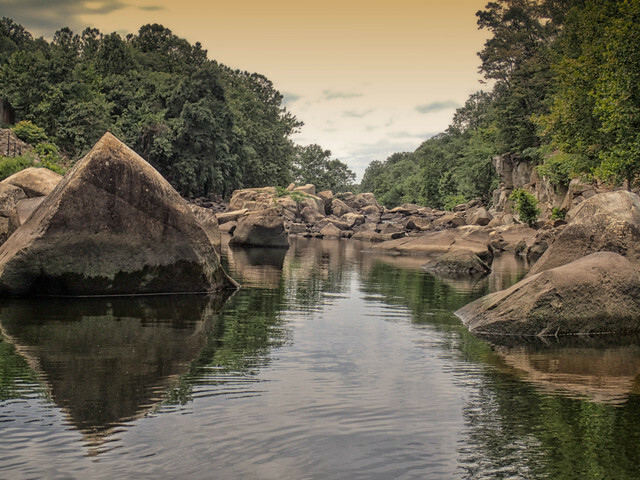 I take my mirrorless camera on the kayak with me because it’s weather sealed (and if I drop it in the Potomac I won’t have AS BIG of a breakdown that I’d have if I dropped my dSLR and a telephoto lens into a river just a few months before we go to Africa), so I whipped it out and took a ton of pictures, all excited. It took me a few minutes to even realize there was another kayaker just behind me, who was doing the same thing, although with a dSLR and the Canon 100-400mm. So we ended up talking (I don’t know what’s up with me chatting up wildlife photographers all the time because I’m normally very shy, but it happens) and I told him he was much braver than me taking that setup on a kayak. He said you just have to be very careful. 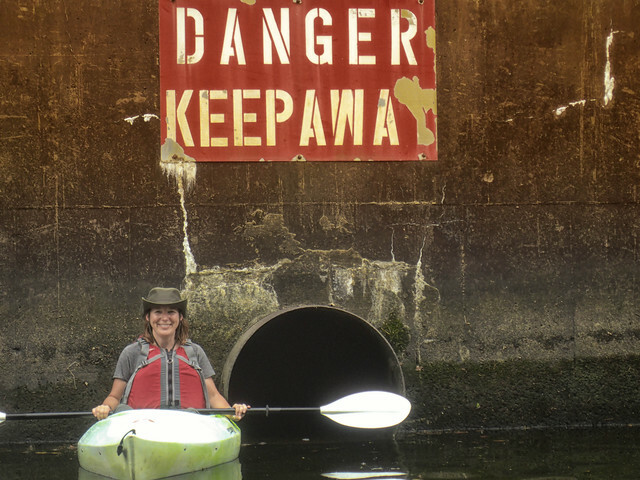 (I’m pretty careful with my camera equipment, but I don’t know if I’m a careful kayaker. I’m a new kayaker.) And of course, when I went to process my pictures I was kicking myself for not being as brave as that guy because they sucked. 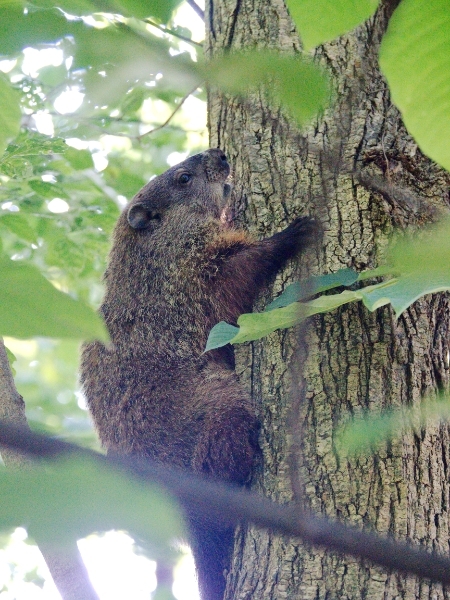 I’d have gotten some spectacular shots if I’d had my dSLR and 400mm lens. I deleted all but three, including all of the ones where you could see the mother actually putting the fish into the baby’s mouth. 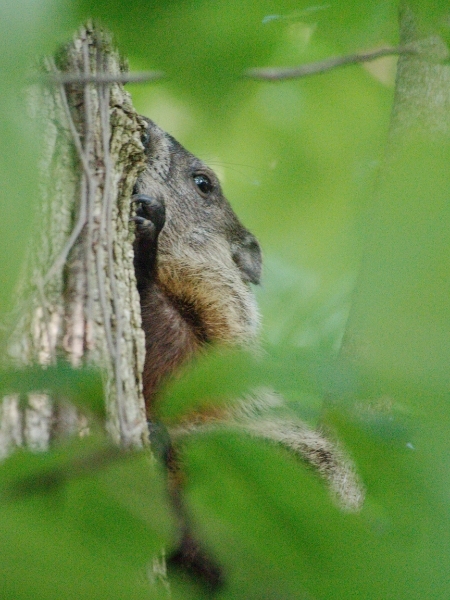 I love my mirrorless camera for some things, but not for wildlife. 🙁 Of course, it’s really hard to take telephoto pictures on a kayak anyway. 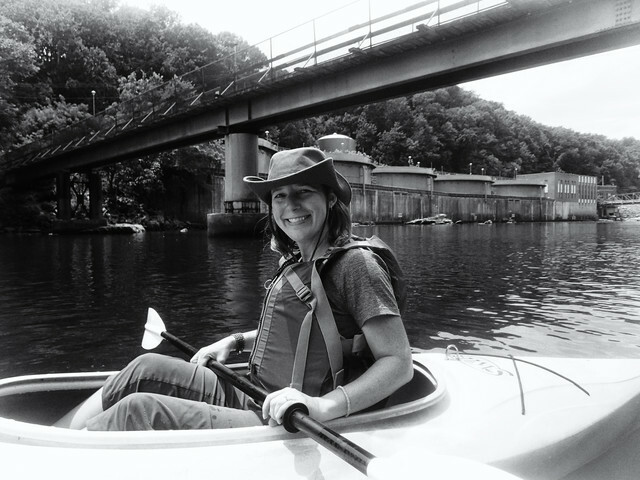 Even if I weren’t scared of losing my camera, it’s practically impossible to sit still in a kayak. 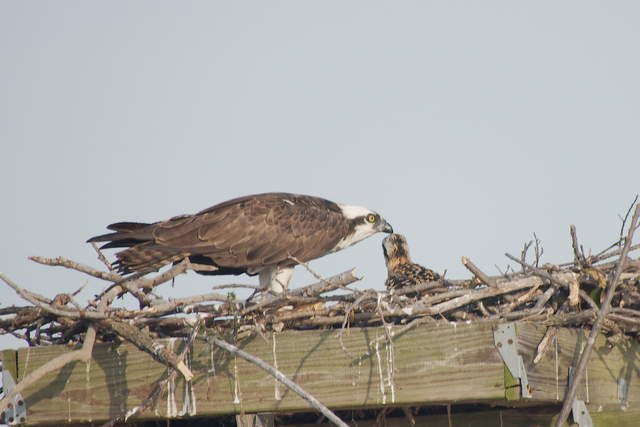 Parent feeding chick > Renae feeding chick. I’d been saying for several years that I knew one day I’d get into canning, but it wasn’t until last summer than I finally took the plunge. I bought a bunch of new canning jars (although I already owned a great deal of vintage jars that I store food and goods in, and ferment things in, and dispense soap from, and drink out of…you get the picture: I had a lot of jars and I bought a lot more jars) and Marisa McClellan’s wonderful Food in Jars. 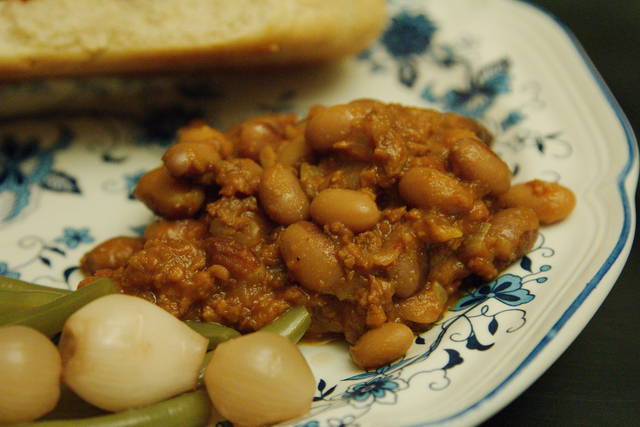 I’d been reading Marisa’s blog for a long time, so I had a good idea of what I was getting into, and I knew I’d trust her recipes to be both tasty and safe. Marisa’s book is a fantastic resource for the new canner, and especially those who might be daunted by visions of 15-hour canning sessions, pounds of fruits or veggies to peel and cook, and tons of finished jars of store…and eat. 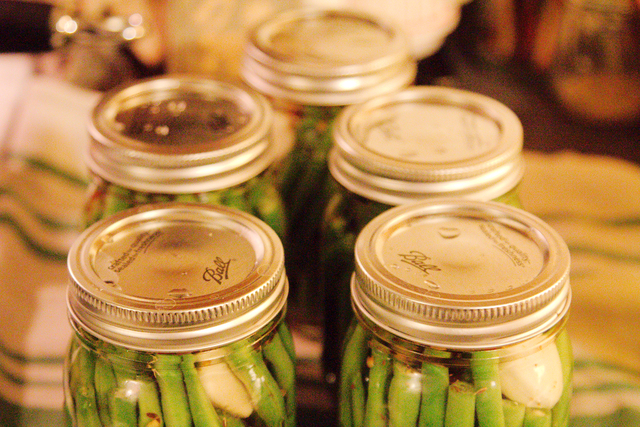 Food in Jars is great because most recipes yield about 4 pints, which is perfect for trying out recipes with little investment, squeezing short canning sessions around busy schedules, and not overwhelming small households with hundreds of jars of the same thing. Plus, Marisa is personable and very responsive to commenters on her blog. 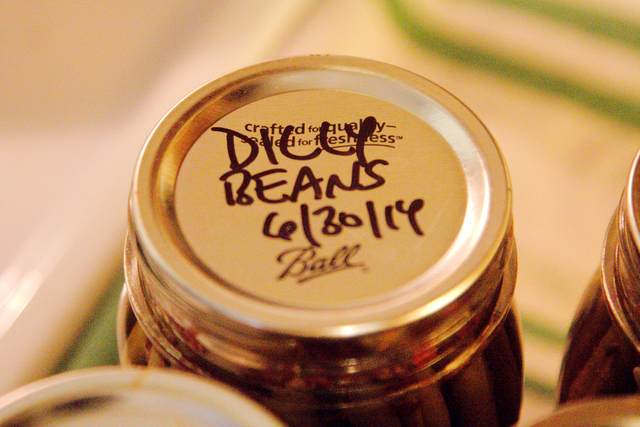 The first recipe I made from her book, and the first thing I ever canned, was Dilly Beans…which I think is probably the first thing a lot of people try. And for good reason: they are easy and delicious! Since Marisa generously shared her recipe on Serious Eats (it’s actually slightly different than the one in the book in that it makes 5 pints instead of 4, and which worked out perfectly brine-wise for me), I’m going to go ahead and repeat it here with my photos just to inspire any of you out there who are like me and want to try canning but are worried about the initial investment or the time it might take up, or think it might be difficult to do. However, if like me you end up enjoying canning, I strongly urge you to buy Food in Jars or Marisa’s new book Preserving by the Pint, because the recipes are good and easy to understand and there is a ton of info for new canners. About the vinegar: although I use it by the gallon around the house, I usually don’t cook with white vinegar, preferring a myriad of flavored and homemade vinegars, however, in an unprecedented move I followed most of the canning recipes I used last summer faithfully instead of getting creative, and not only did these turn out delicious, but everyone I’ve served or given them to has raved, so I’m sticking with the white vinegar for now. In an older version on her blog, Marisa uses apple cider vinegar. 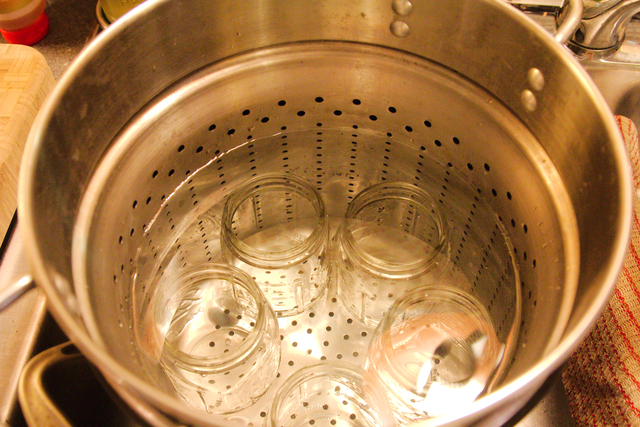 canning jars and rings – You will need 5 pint jars for this recipe and they will come with rings, which hold the lids on in the boiling water bath until they’ve sealed to the jar. lids – Although you can and should reuse the jars and rings for many years, lids can only be sealed once. New jars will come with a new lid for each jar, but if you are reusing jars, you will need to purchase enough new lids for the batch you plan to make. As much as I love kitchen gadgets and pots, I have no desire to buy a dedicated canning pot (unless I later decide to get into pressure canning, which doesn’t really interest me at the time). 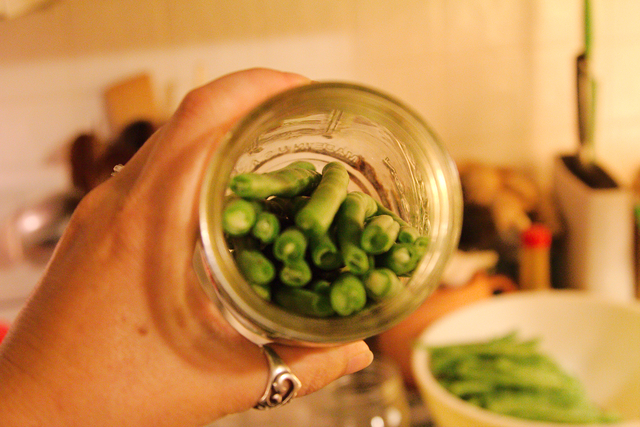 I already had this 12-quart Calphalon stock pot and pasta insert that is perfect for up to 5 pint or 4 quart jars. Unfortunately I can’t really find it for sale anywhere; I bought it as part of a larger set years ago. But if you already have a large stock pot, you can easily rig something up without a pasta insert, just by putting a heat-safe trivet on the bottom for the jars to sit on. 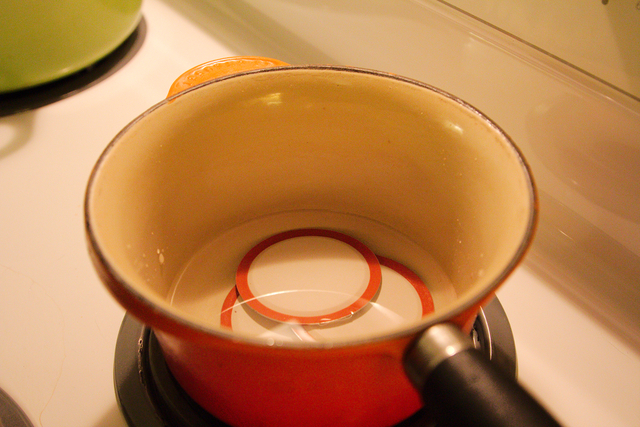 Put the lids in a small saucepan, cover with water, and bring to a very low simmer. All you want to do is warm the seals on them so they adhere to the jars later. Use your jar lifter or tongs to remove the jars from the water (very carefully pouring the water out of them without spilling it on yourself) and place them on a folded dish towel. You can keep the water simmering while you continue prepping. Prepare the brine by combining the vinegar, water, and salt in a medium pot and bringing it to a boil. Let it simmer until you are ready to use it. I saw this fourth burner pot on Marisa’s blog and yes, I DID have to buy it, but I don’t use it just for canning. 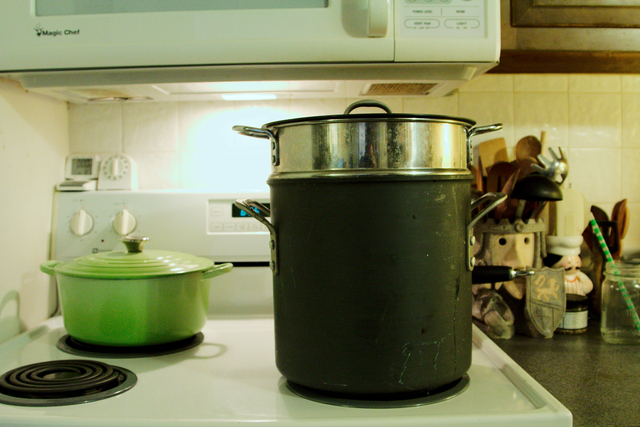 You can absolutely use any pot you have that the brine will fit in; I just like this one because it has a spout that makes it easy to pour into the jars later, and also when canning, the stove tends to gets crowded and this pot takes up little stove real estate. 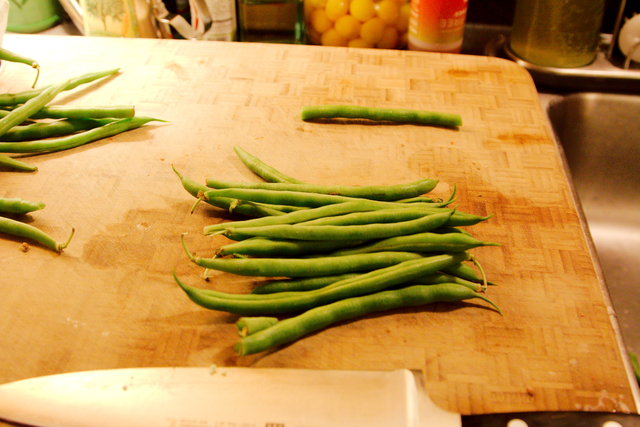 Next, prepare the green beans (or you could do this ahead of time if you are more efficient than I am). I don’t do that whole bean snapping thing. I just do not have the time for that nonsense. I line a bundle of beans up, chop off the ends with a sharp knife, turn the bundle around, line them up again, and chop the other end off. 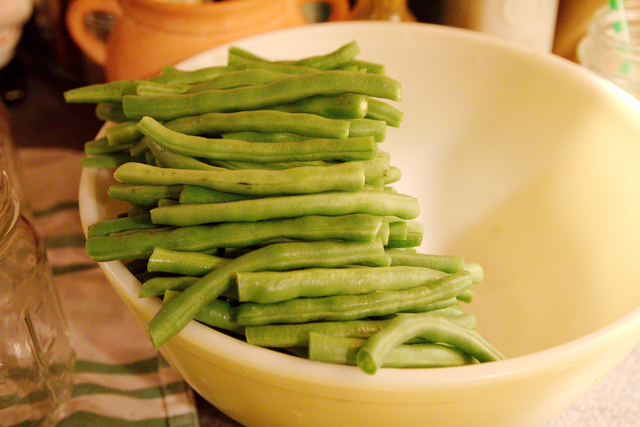 The important thing here is that you make sure the beans will fit in the jars, so what I do is trim one to the perfect size for my jars then lie it on my chopping block as a template. I’m not super fastidious about this, but if you don’t make them short enough to fit, it’s annoying later to go back and trim them down. 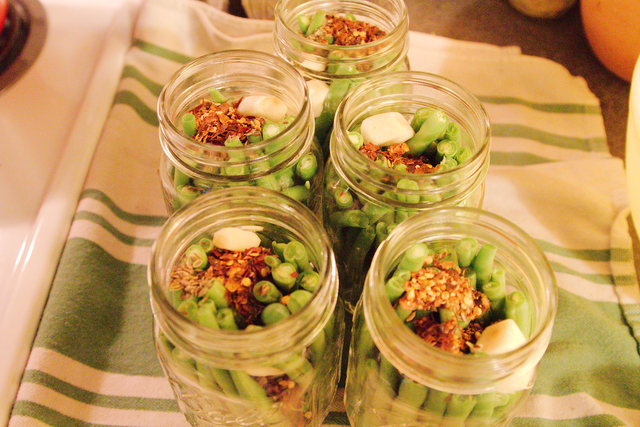 … then shove another bundle on top, then sit the jar upright and fill in any gaps with more beans. Put one clove of garlic, 1 tsp of dill seeds, and 1 tsp of chili flakes or cayenne pepper or one whole chili pepper into each jar. 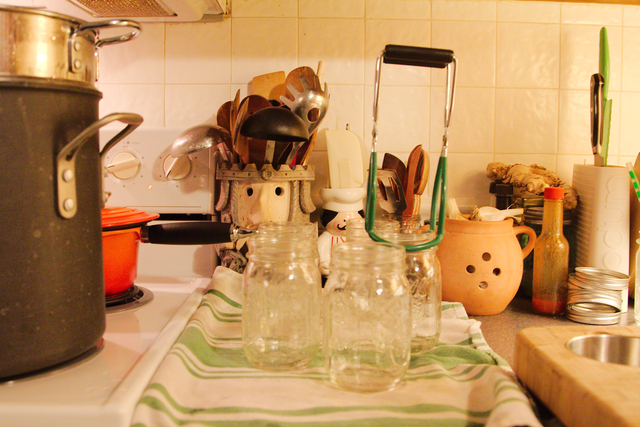 Use a clean towel to wipe the rims of the jars (spilled brine could keep the lids from sealing properly). Next, turn the burner under the lids off and carefully remove the lids from the pot, placing one (seal-side down) atop each jar. 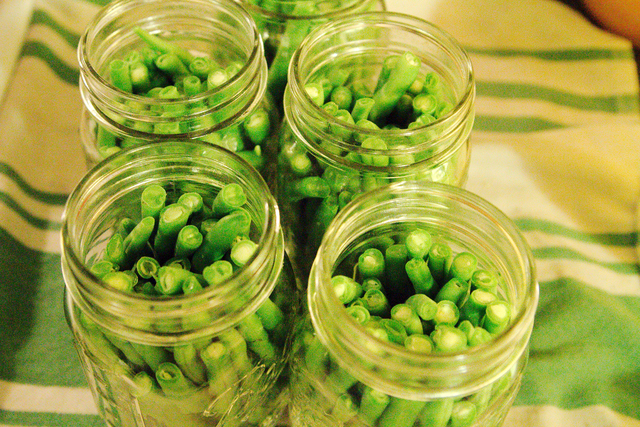 Screw a ring onto each jar just until hand-tight. 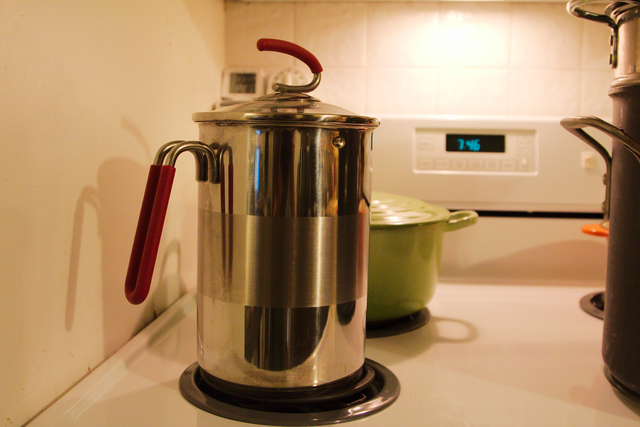 If necessary, bring the large pot of water back up to a rolling boil, then use the jar lifter to carefully place each jar onto the insert on the bottom. You will probably have to remove some of the boiling water from the pot now that the jars are full; I use a 2-cup Pyrex measuring cup to do this or you could use your small saucepan. Once all jars are in the pot, you want the water to cover them by about 2″ (so they are entirely submerged even when the water is bubbling). This picture is hazy because my camera was looking straight down into the steaming water. As the lids seal, you may hear a little “ping” from each one. This is a joyous noise because you know the lid has sealed when you hear it, however, not all seals will ping, so don’t worry if you don’t hear it. I usually hear a ping, but none of these five pinged for me and they all sealed. 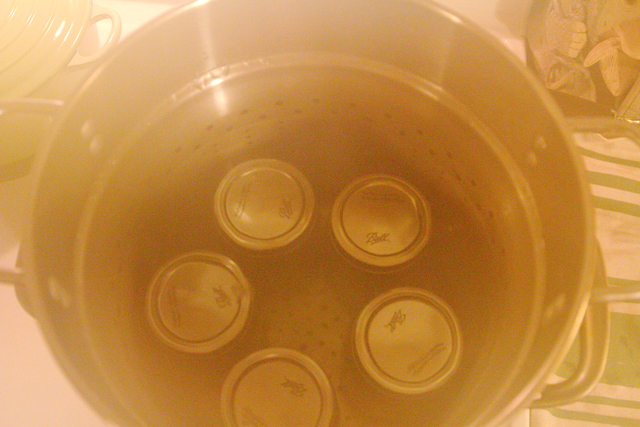 Let the jars sit overnight (or 8 hours) to completely cool, then you can remove the rings and test the seals. There are two tests you can do: 1) push the middle of the lid slightly. If it gives or pops, the lid is not sealed. 2) gently try to pry the lid off with your thumb. If it comes off, it’s not sealed. If you buy quality lids, they should almost always seal, but everyone will occasionally have one that does not. If you have one that didn’t seal, no problem: just put the jar in the refrigerator and use it up first. 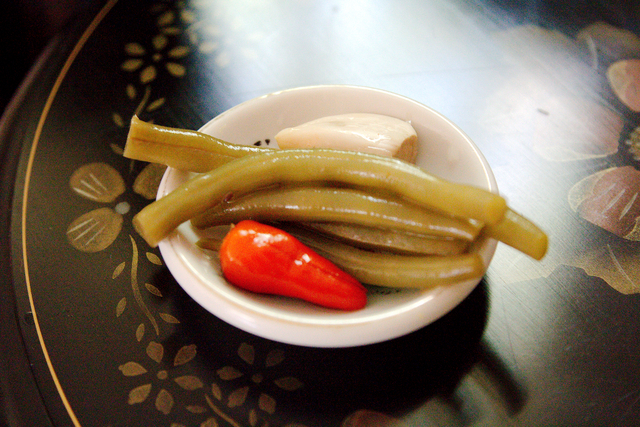 The Serious Eats recipe says wait at least a week to eat these pickles; the book says two weeks. I’ve always waited two weeks, which may seem interminable, but believe me, it’s worth it! Some people don’t know how to open a sealed jar. I use the bottle opener hook of my can opener (it looks like this one), but you can also use a church key or dull butter knife or spoon. I’m extra excited about canning season this year because all I’ll have to buy is new lids, so it’ll be much cheaper this year than it was last year when I had to make the initial investment in the jars (which aren’t really expensive, but I bought a lot). 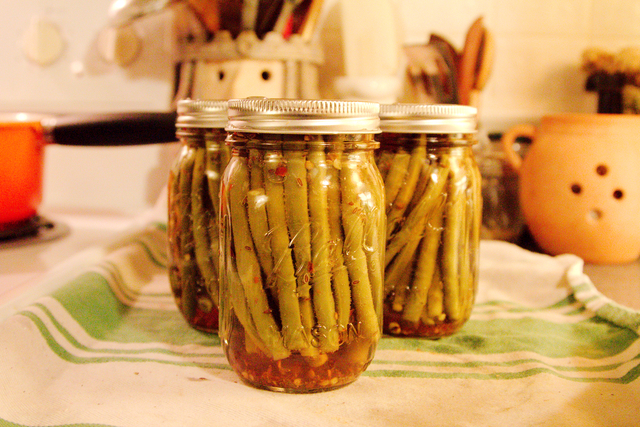 And canning just does it for me. I’m as guilty as most other Americans of generating more waste than I have any right to burden this planet with, but I HATE it. I get really, really sick thinking of all that trash sitting in landfills, most of it not biodegrading, and all the plastic floating in our wonderful oceans. It’s true I keep on consuming, but I really try to think about packaging, and purchase as little of it as possible. 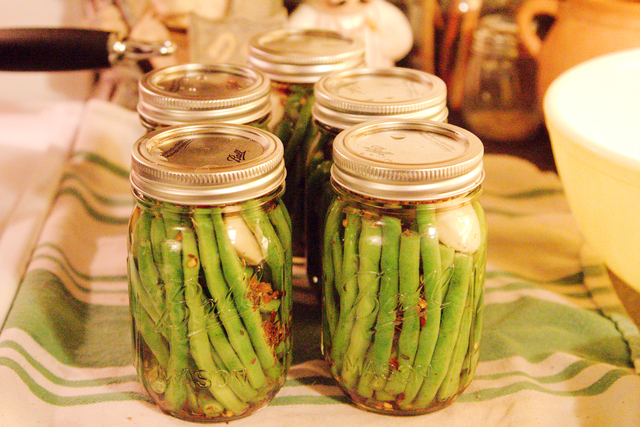 To me, canning is just so great because I support my local farmers by purchasing everything I can from the farmers market (I’d grow it myself if I didn’t have a black thumb! ), and I carry it all home in my market basket and reusable shopping bags, and I can it in reusable jars, and not only do I have a bounty of delicious, local ingredients to enjoy year-round, but I’ve wasted NO PACKAGING. It just makes me deeply happy. 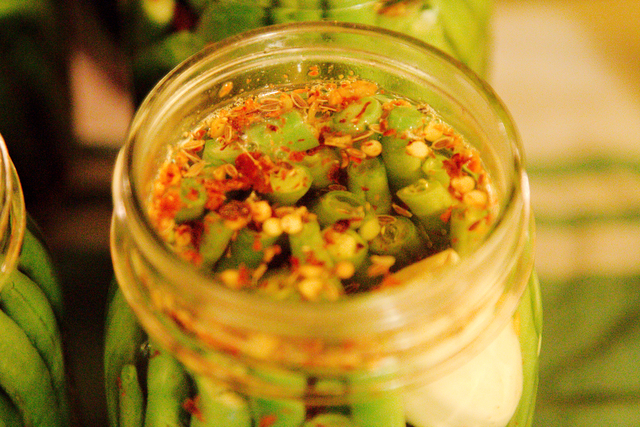 And I have LOVED opening my jars all year and enjoying the contents. I’m still amazed every time I open a jar of my home-canned tomatoes and they smell just as fresh as the day I canned them. It’s a scent and sensation I’ve never gotten from commercial canned tomatoes, even the really expensive ones I’d buy because I’m a pizza snob. 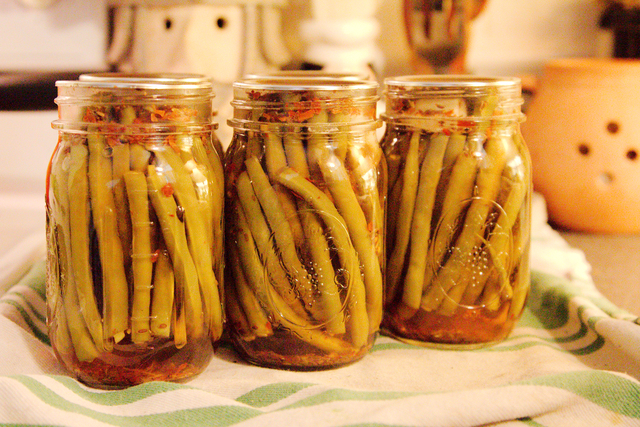 So if you’ve been on the fence about trying canning, hopefully I’ve given you the push you needed to try it out this year – it’s very rewarding. And it doesn’t have to take a lot of time.